This blog entry was originally posted on October 14, 2003. ...but 35 lbs. (15.876 kg) of pennies, is how much earned? I’ve had this empty tin can from Danish Butter Cookies that I’ve filled with pennies over the years, whenever I’ve remembered to. Realizing that I’m about to leave for a really long time, it’s about time I cash it all in and see how much it actually is. How much do YOU think it’s worth? Post your guess as a comment. The closest guess without going over (Price Is Right style) gets a postcard! it’s 520 pennies!!!! now give me my share of that! This sounds like a question which Microsoft would ask in its interview. So just let me pretend that I am being interviewed (the postcard, after all is a prize catch). everyone knows that 10lbs of pennies = $10. Its science afterall. You can’t beat science…well, maybe with magic you can. I think it’s about $55.15. Are you going to use this for a couple of hostel stays? are we suppose to factor in the Coin Star surcharge? if so, my second “scientific” guess is $12.00. I will be using the “Penny Arcade” machine at Commerce Bank, which is free-of-charge and more accurate than CoinStar. 55 dollars 32 cents—see ya Friday. Hey - what do I win if I’m the closest? How much do I think it is worth? 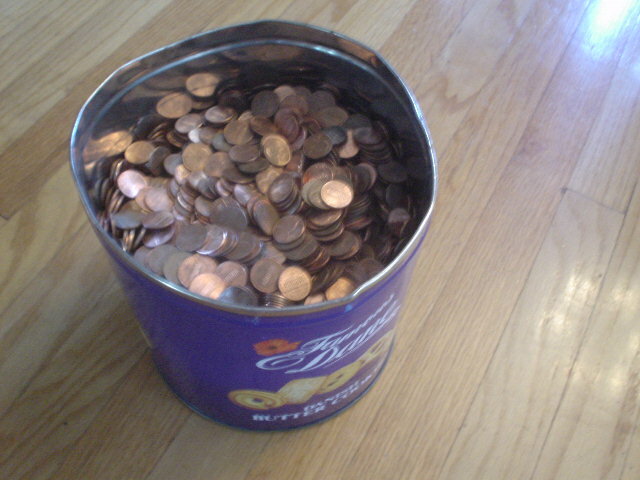 Less than the effort it would be to lug 35 pounds of pennies somewhere to get cashed in. I look forward to my postcard. $69.69… whoever took $69 is a feg..
I’m already gettin’ a post card so there! Two post cards would be nice though. C’mon Erik, think BIG! How big is that can? I can’t tell from the picture how full it is. Where’d you come up with 35 pounds?
? 36.80 - Can I have the tin when you get back form Commerce?? Ah no, scott. The weight of the can was factored in, while rounding off. E when are you giving us the answer? Well arn’t you going to tell us how much you got? I know there’s no space in your pack for that tin! I aways open my big mouth before I keep reading! Come on baby! Mamma wants a post card!!! Taking into consideration the weight differential of tarnished coins versus newly minted and the average age (year) of U.S. pennies in circulation cross-referenced with known weight variances of certain batches produced within those years (taken from the U.S. Mint’s production database)...this is our humble guess (not considering the planetary gravitational pull on the geographical location, time and day you weighed the coins). Haha…just kidding. We just used a simple algorithm based on chaos theory and quantum mechanics to make our guess. Cheers.